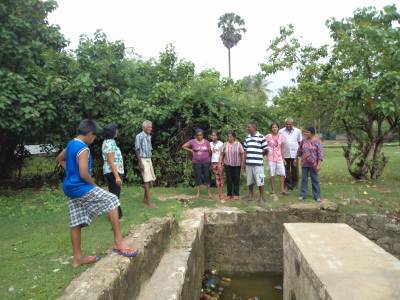 Activities Group consisted of first timers to Jaffna. So the main objective was to show them around. I had a personal agenda on which this trip report is based. Weather Scattered rains later developed to a thunder storm when we reached Mullattivu. Route Colombo -> Kurunegala -> Dambulla -> Kekirawa -> Anuradhapura -> Vavuniya -> Jaffna and return through Mullattivu on the same route. 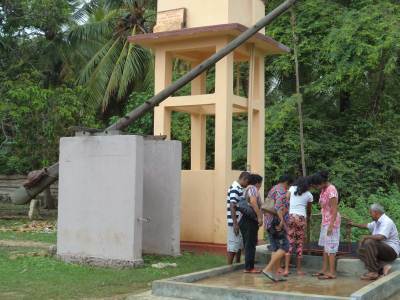 Younger generation in Jaffna is now more friendly and comes forward to provide information and guidance. The visitors from South have a duty to encourage them. 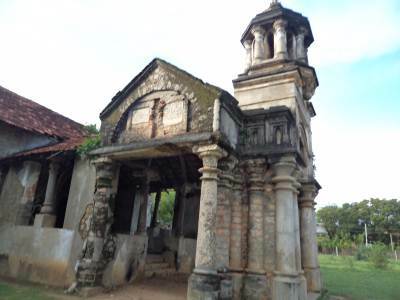 General attractions of Jaffna Penninsula are already covered adequately by forum members. So I don’t intend to repeat the same things other than exceptions. 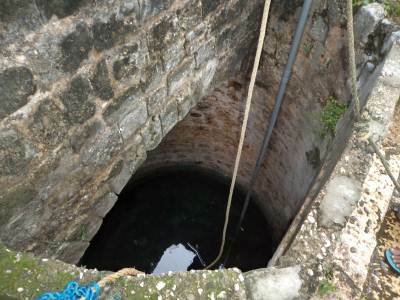 In fact, I was invited to join the trip as all others, except my wife, were first timers and in need of a guide. 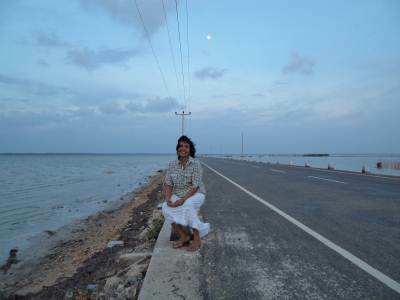 We started from Maharagama around 8.30 pm on the first day and reached Jaffna by 6.00 am on the second day. After checking in to our Rest, we immediately proceeded to Nagadeepa to avoid the expected mad rush. There was a less crowd at ferry point. 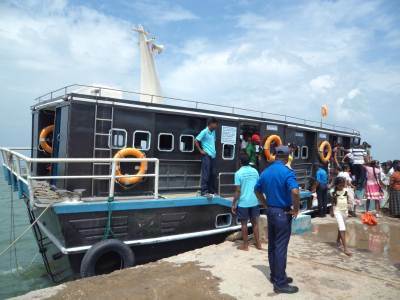 The temple has introduced a semi luxury launch which can carry more than 400 people with comparatively safer manner. On our way back, the launch was navigated by a young priest of the temple. When we left the Rest, our Rest Keeper insisted that we should have lunch at Nagadeepa Kovil. 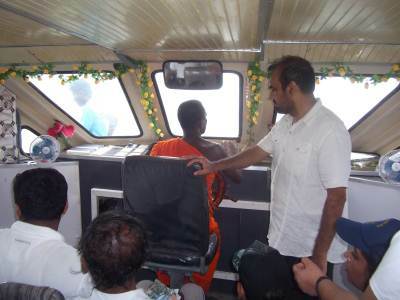 According to him, the business community of Jaffna contributes to provide free lunch for any number of visitors. However we were unable to enjoy that free lunch as we left the Kovil before lunch time. You may plan your trip to coincide with this free lunch!!!! 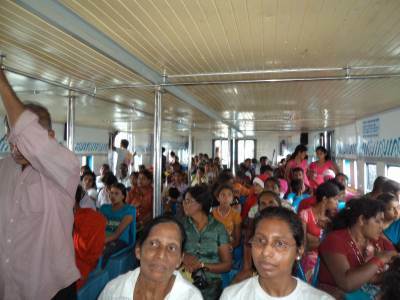 We came back to Jaffna by 2.30 pm. We spent the rest of the day to visit Naga Viharaya, Fort, Library, Railway Station and Nallur Kovil. On the second day, we went to Valvettiturai with intention of coming to Keeramalai through Palali and KKS. However half way towards Palali, we were informed that the road is still closed. 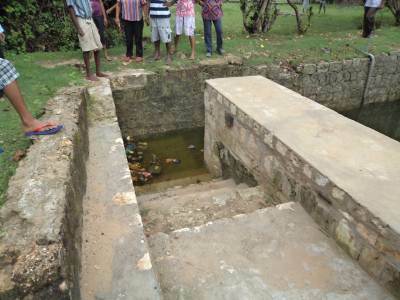 So we were compelled to come back towards Jaffna up to Pottur to see the tidal well, then we proceeded to see Kadurugoda Viharaya. The road to Kadurugoda Viharaya is under repair, so we had to park the vehicle in the nearby kovil premises and walk to the ruins. One of our group members has a touch of rheumatism, hence had a bad time while going and coming back. Near the kovil we had an extra friendly chat with a resident Tamil lady. She showed us a mini Aandi well just behind the kovil and encouraged us to use it. 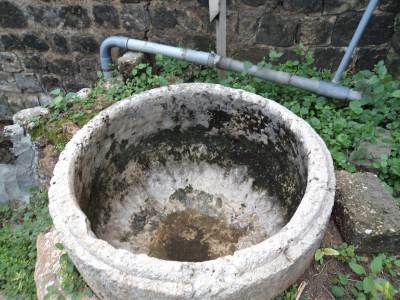 Our kids had a gala time drawing water from the Aandi well. I grabbed the opportunity to explain them how Aandi well contributed to agriculture in Jaffna in old good days. (Hope we would be able to achieve back a similar environment again). From Kadurugoda, we went to Keeramai. 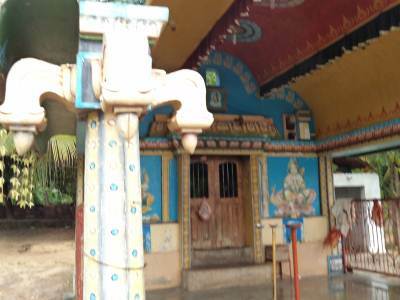 Naguleshwaran Kovil is one of four Shiva Kovils located at four corners of the country. 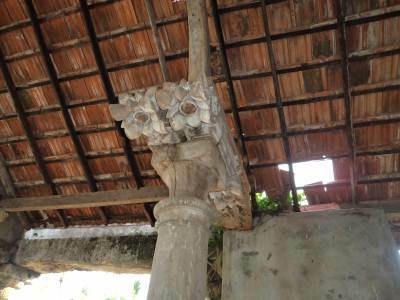 I have already visited Koneshvaran Kovil in Trincomalie. 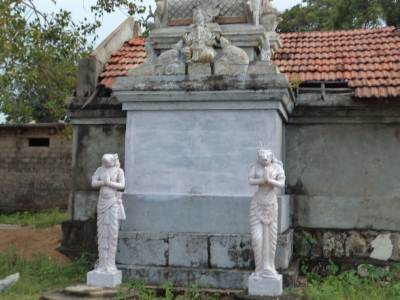 Other two Kovils in Devundara and Mannar are yet to be visited. 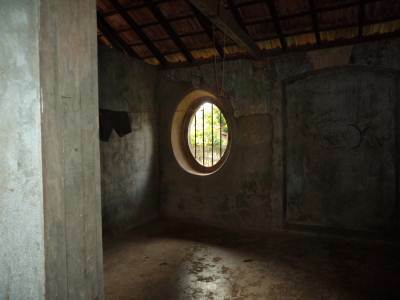 Near Keeramalai Ponds, a new Pilgrim Rest is now built. Staying there for one night would be real fun. Unfortunately no one was there to get any information. I request a future visitor to get details and let us know. From Keeramalai we proceeded to Dambakola Patuna. 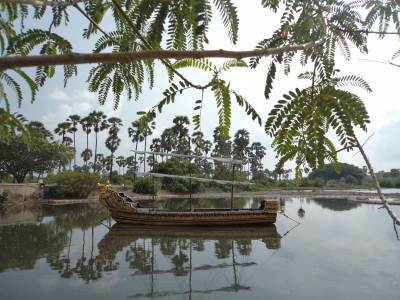 The replica of the ship which carried Sangamitta Therani is a new addition to the place. Real fun for kids started from this point onwards as we proceeded towards Kashurina Beach. We had a nice experience while on this patch. We stopped at a small shop where a bunch of ripe and mouth watering bananas were hung. One of our members got down to check the price and came back fuming. He said that the shop owner wanted Rs. 45 per banana. He thought that they were taking the advantage of us being visitors. However I sensed something wrong and got down to find that Rs.45 was for a kilo!!!!! That was really cheap. Our group felt ashamed of the misunderstanding and chatted a bit with the shop owner and his wife mostly in sign language. Kashurina Beach is six kilometers away from the shop which is on the main land. 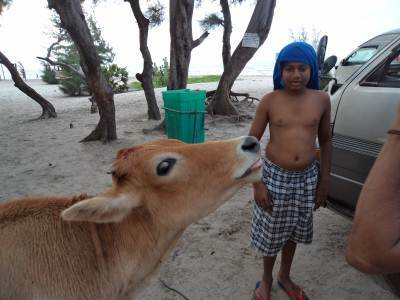 While we were getting down from the vehicle at the beach, the shop owner came to meet us on his motor cycle. Reason !!! We have left behind two mega bottles of soft drinks purchased from the shop. Good of him. In our group there was a shop owner who admitted that he would not do it!!!! Ironically he was the one who misunderstood the price of bananas. Somehow, so far the visitors have failed to destroy the beauty of Kashurina beach. Kids were in water for more than 4 hours and we had to force them out by reminding the promised ice cream treatment at Reo Ice Cream Parlour. On the third day I told the group that I needed few hours for my own agenda. 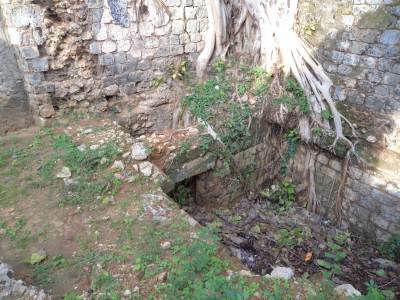 I was determined to visit and see remains of King Sangili who is said to have contributed an ultra cruel patch to our history. May I take the liberty to write few lines about King Sangili. 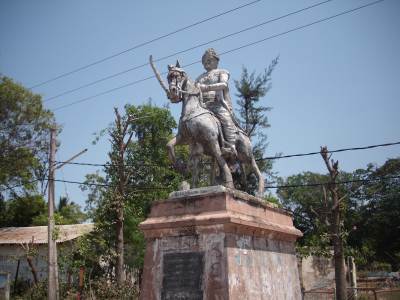 Prince Sapumal was the one who evicted the foreign invaders from Jaffna in 1449. He ruled Jaffna Peninsula for a period of 17 years, on behalf of King Parakrama Bahu VI of Kotte (1412-1467). 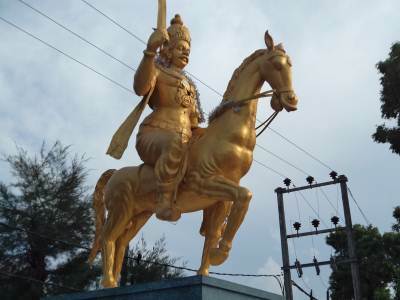 When he left Jaffna to become King of Kotte as Bhuvaneka Bahu VI, he left as his proxy one ‘Pararasa Sekaran’ of the Pandya line to administer Jaffna. It is said that, this appointee had an illegitimate son from a Tamil concubine. He was called Sangili. 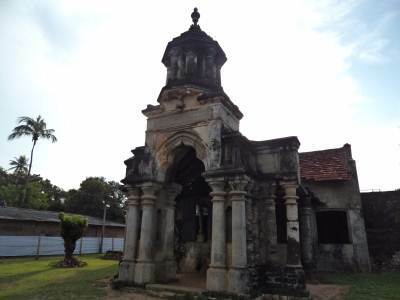 In 1519 Sangili killed his father and assumed power as the Sub-King of Jaffna, forcing the legitimate son and successor to flee to the Portuguese in Goa. King Sangili ruled Jaffna till 1561. During this period, he was as much as an enemy of the Portuguese as King of Seethawaka. 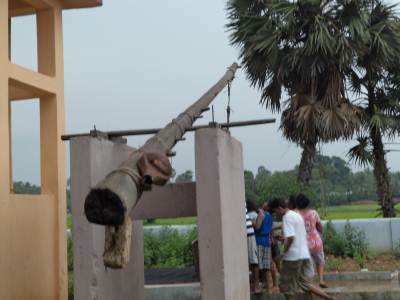 He was instrumental of massacring 700 Catholics in Mannar in 1544. 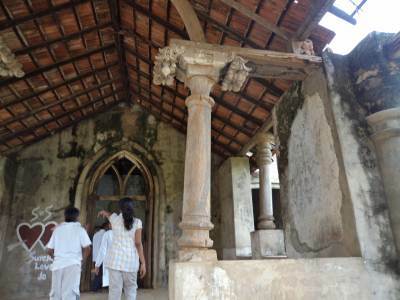 When Vidiya Bandara who had fallen out with Mayadunne and carried with him a part of the treasure of Kotte and replica of Tooth Relic, sought the protection of Sangili, he accepted him but later arranged to kill him in an attack at a religious ceremony, making it appear to be an accident. This was about the year 1556. 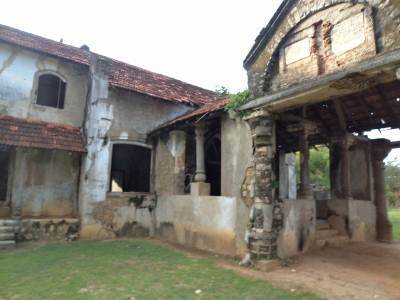 Soon after this Sangili started killing the Sinhala people in the same way as he had the Christians of Mannar. 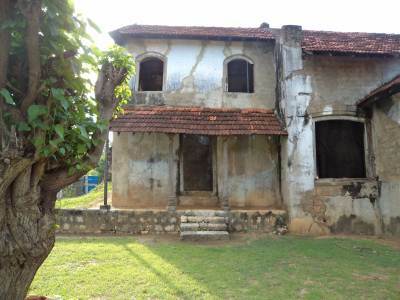 In addition he destroyed all Buddhist Religious Places of historical value including Kadurugoda Viharaya. King Sangili was killed by his own son, Puviraja Pandaram in 1561 who took over power as “Sangili ii”. . He was deposed and sent to Colombo with two of his nephews in 1619, and later taken to Goa, tried for treason, and executed. We started the day with the above history in mind. Our first stop was Nallur Kovil, which is believed to be built by Prince Sapumal. 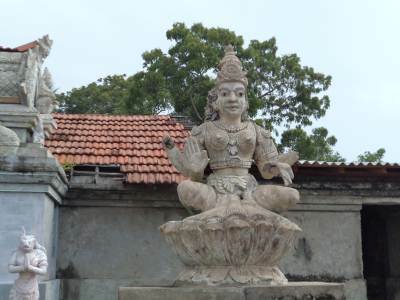 The Kovil being devoted to God Skanda ( God of Katharagama) strengthens this belief. 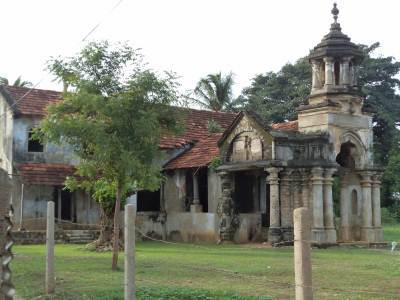 When Portuguese destroyed the Kovil, King Sangili protected the relics of the Kovil to be replaced when the Kovil was rebuilt later. 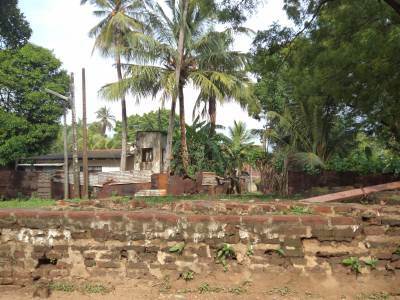 Several hundred meters away from the Kovil along Point Pedro Road, we met King Sangili on horse back with drawn sword. 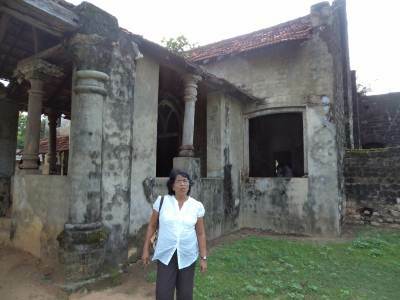 We proceeded another two hundred meters towards the same direction to reach Rajamanthri Walauwa which was the residence of King Sangili’s Chief Minister. The construction is still in one piece and at the time of our visit, there were some foreigners going through. A caretaker appointed by local authority guided us too. 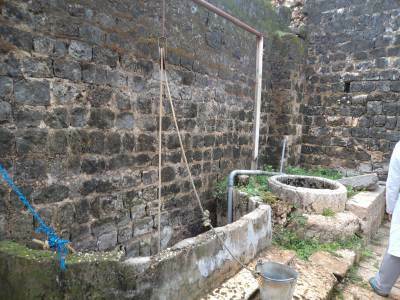 Some people are trying to label this Walauwa as the palace of King Sangili but the construction seems to be too small for a palace. The complex is in extent of 3 acres with three entrances. 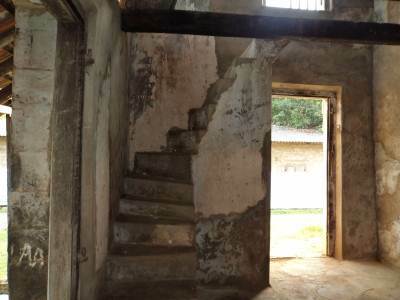 The building is two storied but upper floor is no more except the staircase. 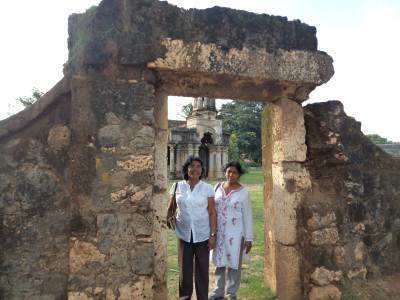 About two hundred meters from Rajamanthri Walauwa, towards back to Nallur Kovil, on the other side of the road, there is an arch believed to be the entrance to King Sangili Palace. The arch bears the name of King Sangili which was built later as an ornamental land mark in the Portuguese tradition. Just behind the arch there is a newly constructed building. 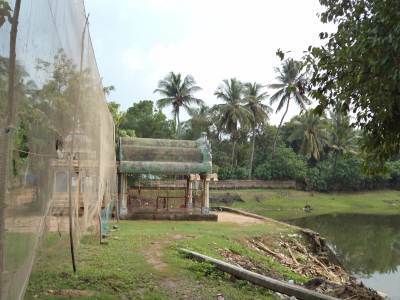 Behind that, some ruins can be seen with a small lake and a kovil. When we proceeded back towards Nallur Kovil, on the same left side of the road, we met Yamuna Road. I was in search of my next point of visit which was Yamuna Pond. We asked several people but the given directions were confusing. Finally we found the place. 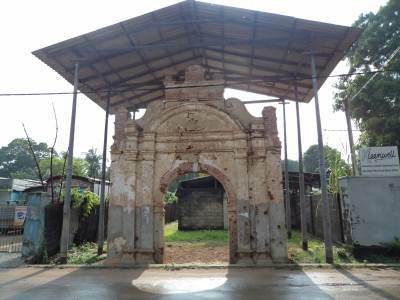 Between Yamuna Road and the statute of King Sangili, there is a gravel road which appears to be a dead end but it turns to left to reach an open area behind the Sangili Arch. 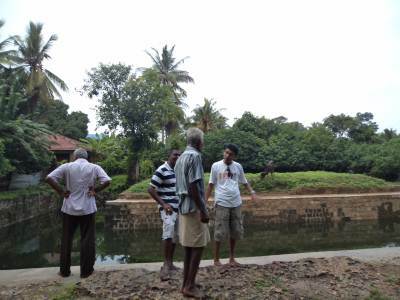 We found some ruins, a small lake and a kovil there. 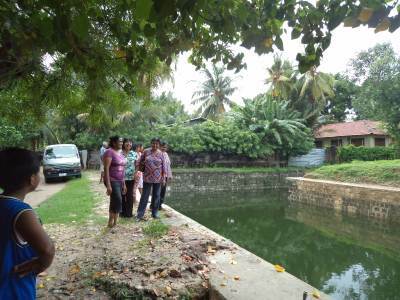 We mistook the lake near the Kovil as Yamuna Pond and started taking photos. A person of a nearby house came and told us that is not Yamuna Pond. He volunteered to guide us there. It is a walk of 300 meters. 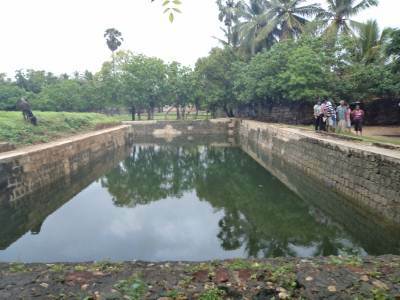 Below are some photos of Yamuna Pond which was believed to be used for bathing by the royal ladies of Sangili Palace. Next day we came back through Mullattivu.